A high vitality makes it possible for a pigeon to have greater energy reserves during races than his competitors in general. The in-flight energy losses fatigues the constitution of such pigeons less. They need to mobilize less power to get home on the same races or, when everything is needed, to fly the soul out of their body. In that case, the average pigeon is already far behind. Pigeons with excellent vitality recuperate faster, they are quicker able to form new reserve in kidneys and liver, and as a result of this, also get faster back in shape. I don't think that I need to say more to my sport friends who raced good how much this means in practice. More classification results, more prizes. It is therefore wise to keep only those pigeons in the racing loft who possess an excellent vitality. I shall elaborate on the heredity cycle of vitality later. "De Grote Jaarling" was 7th Nat. Ace Dayraces as a yearling. He is son of "De Etampes"(out of "De Goede Jaarling") with "Gisele"(out of "De Zwarte Baron"(grandson "Het Boerke") and "Het Boerinneke"(out of "Het Boerke". Note: "Het Boerke" and "De Goede Jaarling" are halfbrothers). Brothers of "De Grote Jaarling" finished 2nd Nat. Bourges, 5th National Orleans, 7th National Chateauroux. Plus 4th, 9th & 11th in National Dayraces competitions! All pigeons blink in winter like spit polished shoes. However, when they are going to mate, and fight somewhat, a part of them becomes mat, their shine evaporates like snow in the sun. Then the eggs come, and they breed. During this period they recuperate and they look better again. When the young arrive, we suddenly notice that the majority of our pigeons' condition regresses. They become colorless so that we hardly recognize our pigeons who shined like a mirror in the winter! We don't find vitality here! A pigeon with a great vitality doesn't lose his shine during mating, breeding and the upbringing of the youngsters. One doesn't notice change. Their nose tips are white as snow, their muscles don't lose body, elasticity and shine of wings remain unchanged. Such pigeons possess an above average vitality. Such a constitution can also cope with a lot in the basket while other pigeons only show something on those competition races which are lighter and demand less power. They also can form considerably less reserves. We dream the whole winter that we have wonderful pigeons in our loft for the next season. But when the first efforts must be made, the mating, the training races during cold weather, suspicions emerge already that perhaps our glorified birds are no swans but ordinary turkeys. And the suspicion becomes reality later on. It is nor foolish to try out an advice from Wilhelm Scheer. He suggested once to feed only a half portion for 3-4 days during winter and not to let them out. Then one must enter the loft at night in the dark together with someone who writes down all remarks and who gives us the pigeons in hand one by one without knowing which pigeon it is. Perhaps we get a more realistic evaluation this way regarding the taxation capacity of our pigeons. How quick they use their reserves tells us something what to expect of our pigeons on long and hard races. And he is right! Pigeons who badly bridge the period of upbringing of offspring have not much value because they possess a bad vitality. Also pigeons who become fat easily and quickly gain weight are not recommended. Real class pigeons never become fat, even when the feed is ready for them day and night. It is a good sign when a pigeon doesn't attack the feed bowl immediately, but behaves as if the feed is not the least bit of interest to him. When the rest of the gang has eaten about half, they walk slowly to the bowl with a bored expression and pick up a few grain corns. There is nothing wrong with the vitality and taxation capacity of such pigeons. Their organism needs little feed because their capacity to digest is much more perfect than that of pigeons who can only keep going with a lot of food. Good pigeons don't suffer as much from hunger in the basket even when they have to stay in them for days. They are fit at the starting point, and of course, their better organism is to their advantage during the flight. Beware of pigeons who eat a lot, and also for pigeons whose eye color fades as a result of taxation. This character trait reveals the weakness of constitution. The latter only must be taken seriously when it happens more often. 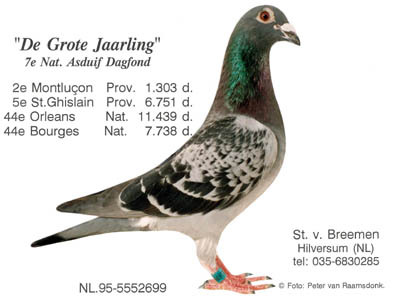 I have noticed this once with my good pigeons "Goed Jaarling" etc. But these pigeons, as soon as the had recuperated, flew later just as excellent again as before. Actually the fading of eyes is closely related to the general blood supply of the organism. The status of blood supply with a pigeon can only be determined from the eye. The shinier the eyes, the more noticeable and deep black the border of the iris, the better the blood supply is regulated and because of this, also the condition and the vitality. One can safely conclude that there is a close connection between the vitality, the blood supply and the condition. A good blood supply is expressed in shining eyes, a black "Vermeyen-ring", and an active metabolism. You don't notice anything when they have a nest. They are always in good condi-tion and need little feed. (The Vermeyen-ring is the black ring at the outer border of the iris, especially noticeable with young pigeons.) The metabolism of older pigeons slowly regresses of course. Their blood supply is becoming less in a regression of vitality. Some Belgian writers feel that a powdery and silky plumage also belong in the chapter of vitality. For some time now, I'm less inclined to consider this a vitality sign. In first place, my Stichelbouts had generally dry plumes without powdering. Yet, a whole series of my best pigeons out of this line, among them the "117" that was provincial Ace pigeon, provided their extraordinary vitality despite their non silky plumage. I'm of the opinion that a great vitality can also be present where the plumage is not remarkably soft and the latter has no close connection with vitality, it is an independent sign of this. I consider the main sign of vitality to be a good metabolism which again is a result of an excellent blood supply. 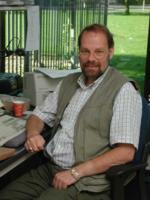 Jan Aerts, the well known writer of "De Duif", always wrote: "Vitality is a long life". Indeed but not only that! A long life is almost impossible without a good vitality. But a good vitality must not be immediately construed as an entry ticket for the club of 20 year olds. But when one devel-ops one's loft out of descendants of very old pigeons, it indicates to have made a good choice when it concerns vitality. Adding his race results to his passing on power "The Klaren '46", the best pigeon in the world, became 22 years old. His last daughter laid 10 eggs when she was 15 years old. However only one was fertilized but that could have been the mistake of her partner who was also a very old son of "The Klaren". Incidentally the only son out of this pair was a prize specimen!